UBC’s new $34-million Biomass Research and Development Facility is cutting edge in the age-old practice of converting wood to heat and power. But the features that make the plant clean-burning also make it hard to replicate. And like UBC's old natural-gas-fired plant, it produces greenhouse gases. 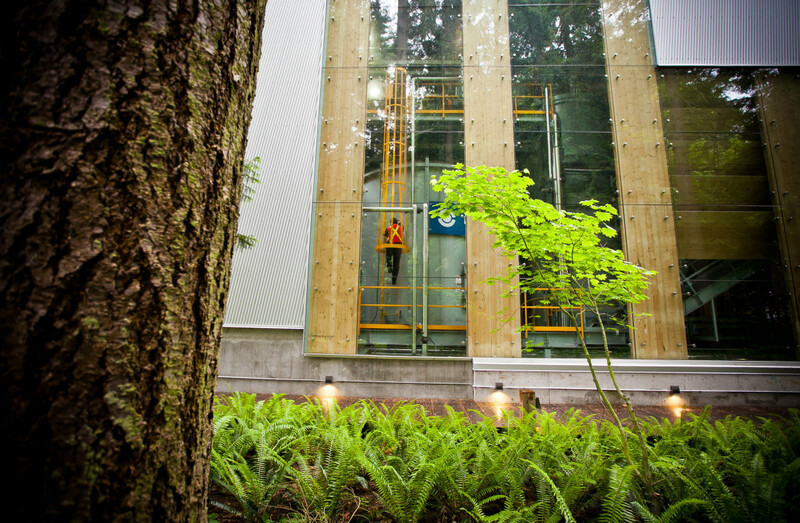 Nestled into a seaside forest on the University of British Columbia’s lands, amid a carpet of sword ferns and salal, sits a gleaming industrial facility that’s been hailed as a significant step toward a carbon-neutral future for B.C., Canada and even the world. The forests of the Pacific Northwest and British Columbia have for millennia provided wood to build and warm our homes. In an energy-thirsty world, could they be our climate savior, too?Yes, say Europe and British Columbia, which have wholeheartedly endorsed wood fuel as a clean alternative to coal and other fossil fuels. The U.S. Environmental Protection Agency is expected by July to clarify whether the agency considers “woody biomass” a climate-friendly fuel.InvestigateWest is testing the assumptions behind the movement to burn wood. We begin with this week’s series on British Columbia’s woody biomass industry, produced in partnership with Canadian newsroom The Tyee.Read more about the project here. That mission is to replace finite, climate-baking fossil fuel with renewable wood to generate electricity. It sounds so darn cool: UBC students charging their iPods on solar energy stored in wood. And indeed, if there is a state-of-the-art to turning wood into power, this is surely it. Its very sophistication may make its accomplishments difficult to reproduce, however. Which is too bad, because when it comes to extracting energy from “biomass”– basically any plant matter that will burn, from switchgrass to whole trees — the impacts on the environment depend very much on the details. And British Columbia is ramping up to sell the world an awful lot of biomass. Most dry biomass will burn. And just like your holiday campfire, it will produce heat, some light, smoke, and invisible gases that are the result of its combustion. The heat is what we’re looking for. But to turn the old saying on its head, “Where there’s fire, there’s smoke.” We want the heat, but smoke is a health hazard. One of the breakdown products of combustion is climate-changing carbon dioxide. The trick is to harvest the heat, without creating noxious smoke pollution or greenhouse gases. The technology at work in UBC’s shiny new plant is the offspring of a partnership betweenVancouver’s Nexterra Energy Systems and General Electric. And it’s nothing like heating a kettle on your campfire. In a two-stage process, the facility first converts chipped wood into a gas with about one-fifth the caloric value of natural gas. The gas is then burned to create steam and generate electricity. Nexterra’s proprietary system cleans up the tars that typically make wood combustion dirty. Burning the syngas produces none of the nitrogen oxides found in wood smoke that in sufficient concentrations can send people to the hospital. And it produces only minute traces of soot — 10 times less, in fact, than even natural gas, itself a huge improvement over super-soot-spewing coal. “We actually rate this plant against Massachusetts and the San Joaquin Valley, which are the two toughest jurisdictions [for air quality] in the world,” Sauder said. “This is a natural cycle,” Mui argued. “Trees absorb carbon as you breathe. But when they die and they rot, they also release carbon.” The benefit of using biomass for energy, he argues, is that by releasing that CO2 in a matter of seconds instead of over a period of years or decades as wood decomposes, we at least get some juice to run our streetlights and dishwashers. It’s a way to turn the natural cycle to our advantage. That’s the promise of biomass energy, and the reason that many countries, especially in Europe, are switching from fossil carbons to forest-grown ones: it’s renewable energy that, in effect, cleans up after itself. 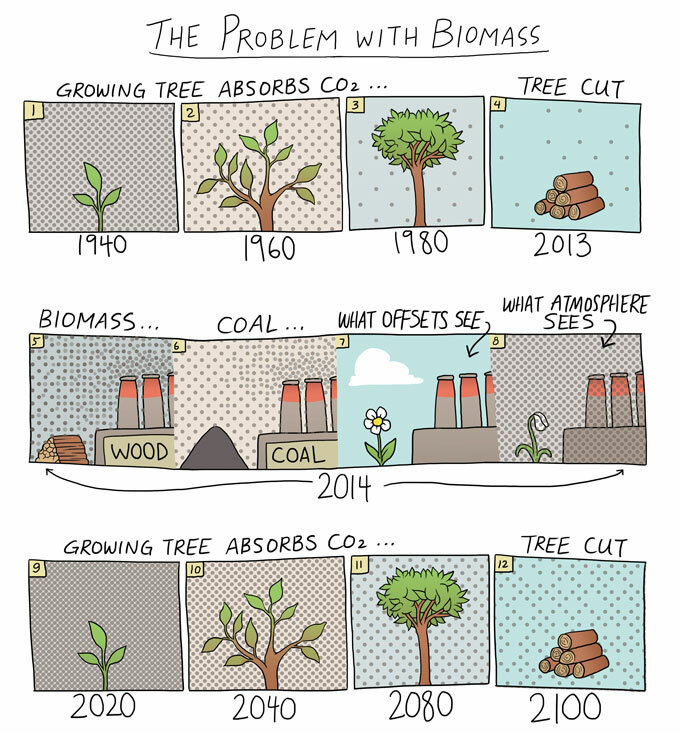 The trouble with biomass carbon “offsets”: Growing trees absorb carbon from the air (1-4). Burning wood releases it again (5); just like burning coal or oil (6). “Offsets” imagine that carbon released from burning wood “cancels out” carbon from fossil fuels (7). It doesn’t; it adds to them (8). In fact, it takes decades for new trees to recapture the carbon released when the old ones were burned (9-12). Graphic by Indiana Joel/The Tyee. For B.C., the promise is far from academic. After disappointing experiences with the other “big three” of renewable energy sources — wind, solar and run-of-river hydro — biomass is one thing the province has historically had plenty of. That’s one reason why former premier Gordon Campbell made it a centerpiece of the province’s 2007 commitment to become carbon-neutral, with a 2020 goal of slashing greenhouse gas emissions by a third. The province had a big head start: it already relied heavily on electricity generated by dams on its major rivers. Hydro reservoirs emit a small fraction of the greenhouse gases of thermal power plants, and provide 86 per cent of B.C.’s electricity. But there is that other 14 per cent. Of the renewable fuels required to close the gap, the BC Bioenergy Strategy declared that more than half would come from some form of biomass. Nine-tenths of that would come out of the forests. That works out to wood-based energy providing roughly six or seven per cent of B.C.’s total electricity needs. For some 80 remote communities off the BC Hydro grid, there may be more to gain than climate cred. Today, many rely for winter heat on electric heaters fed from generators run on diesel that’s trucked or barged in. In addition to the high cost, burning all that diesel produces its own trail of toxic air pollutants and greenhouse gases. For those communities, biomass energy makes great sense from every standpoint, argues David Dubois, who leads the Wood Waste To Rural Heat project based in Cache Creek, near Kamloops. His alternate vision: burning the biomass growing at the doorstep of many such communities in high-efficiency burners directly for so-called “district heating” that serves several buildings. Dubois notes that biomass met only about five per cent of B.C.’s heat needs in 2008. Tripling that to 15 per cent by 2025, he estimates, would save $240 million a year and create more than 600 jobs, most of them in rural areas where they’re badly needed. Total up all the CO2 emissions from the current system, he argues, and it would also reduce B.C. carbon emissions by 830,000 tonnes a year — 166 times the amount claimed for UBC’s power plant. Much the same thinking, on a scale much larger than UBC’s, is behind plans to convert a 46-year-old district heating system supplying heat to the Vancouver Public Library, the Queen Elizabeth Theatre and more than 200 other downtown buildings from natural gas to biomass. The facility’s private owner, Creative Energy Canada Platforms Corp., suggests the switch would cut 14 times more emissions from the atmosphere than UBC’s power plant. That’s assuming, of course, that biomass is carbon-neutral: that burning what can grow back doesn’t change the overall balance of carbon in the atmosphere. This conviction traces to the Kyoto Protocol, the global pact adopted in 1997 that was meant to put the world back on the path to a stable climate by reducing carbon dioxide emissions. The Protocol’s framework considered all fossil fuels — natural gas, coal, basically anything extracted from underground — as contributors to destabilizing the climate. It also assumed that all biofuels, including wood, were carbon-neutral. As a result, for countries trying to reach their Kyoto commitments (Canada formally repudiated the agreement in 2011), burning biomass represents virtuous energy: a fuel that doesn’t add to their emissions total. Selling B.C. biomass to some of those countries has made the province a global-scale exporter, earning about $194 million per year. But here’s what both Kyoto, and today’s biomass buyers and shippers, largely overlook. Yes, the carbon we burn today gets absorbed back into trees eventually. “Over a lifetime,” as Nexterra’s Mui put it. But trees take a long time to grow. And eventually can be many decades into the future. If the forests felled now don’t grow back, it may be never. Kyoto’s accounting however, not only regards the carbon that is supposed to be sucked up by trees growing in the future as a sort of “credit” against fossil-fuel carbon “debt”; it also allows that credit to be “cashed,” so to speak, as soon as the biomass is burned — not when the released carbon is fully sequestered back in timber at some time in the future. Critics argue that’s like saying a family carrying a 30-year mortgage is free of debt, because the debt will be repaid eventually. Meanwhile, guess what? UBC’s $34-million Bioenergy Research and Demonstration Facility will not reduce the amount of planet-warming gases actually being emitted on the campus at all. In fact, it will put out just about as much as was previously produced by burning natural gas: at least 5,000 tonnes of carbon dioxide every year, Sauder said. “What actually comes out of the tailpipe or smokestack is exactly the same,” said Timothy Searchinger, a researcher at Princeton University and co-author of an early article pointing out the flaw in Kyoto’s assumption. So, is B.C.’s biomass the green bonanza its government, its pellet-makers, Dave Dubois and the University of British Columbia think it is? Or is it a form of carbon kiting: spewing emissions, while claiming credit today for carbon that won’t be soaked up in future trees for decades to come? This series tries to unravel that puzzle in its next report, appearing tomorrow on The Tyee and invw.org. Part Two: Biomass Fuel: Worse for Climate than Coal? Olivia Henry contributed to this report, which was supported by the Fund of Investigative Journalism and a Tyee Fellowship for Investigative Reporting. The Tyee award is funded by Tyee readers to pursue a major journalism project in the public interest for British Columbians. A worker unloads a truckload of biomass at the Univeristy of British Columbia energy plant.Credit: Paul Joseph Brown/ecosystemphoto.com for InvestigateWestThe crackling log fire, flickering in an open hearth, may win the day for romance or Christmas cards. From the modern viewpoint of efficiency and good health, it’s more of a horror show. Our ancestors, living in unvented huts lit and warmed by open fires, wheezed and coughed their way to early deaths. Burning wood still releases an old-timey scented bouquet of toxins: nitrogen oxides, sulfur dioxides, carbon monoxide, volatile organic compounds, dioxin, and a couple dozen other chemicals classified as hazardous air pollutants, along with ultrafine particles of super-toxic soot that go deep into the lungs. As a 2007 Health Canada review put it, “Even though wood smoke is natural, it is not benign.”For that reason, a well-run modern biomass-burning power plant is much less smoky than a fireplace. High-tech smoke scrubbers with multisyllabic names like “electrostatic precipitator” and “regenerative thermal oxidizers” scrub their exhaust, and operators work continually to bring down pollution levels, tweaking temperatures and fuels. The state-of-the-art may be UBC’s $34-million Bioenergy Research and Demonstration Facility reported on in the first installment in this series: what comes out of its smokestack is even cleaner than emissions from most natural-gas plants. Wood burning in fireplaces, according to Physicians for Clean Air in Utah, represents one of the largest sources of air pollution. Clearly the dirtier (matter that does not burn) the fuel to more air pollution and there are technical methods to clean up this matter, but it comes with a cost. However going back to using biofuel will be a step to an even earlier energy step, using photosynthesis to split water into hydrogen and oxygen. The form of energy nature has been using for millions of years. When decades ago global warming first came into the news and accepted as being caused by fossil fuels, the obvious solution was to convert to hydrogen, California and Norway started to build a hydrogen highway. It however also woke up those depending on fossil fuels, realizing that this indeed would be the end of fossil fuels. The reaction was not only a lot of misinformation about hydrogen being dangerous, while it is less dangerous than natural gas, but grants and subsidies became available to look for alternative energy sources. This action was so succesfull that hydrogen now is nearly completely of the table. Most problems are solved, by first establishing the cause, followed by a benefit/damage analysis, followed by cost/benefit analysis of the best solutions. This process never took place and the result is that the general public does not know who to believe, while the media provide platforms for every body, thereby making news and science a form of entertainment. The other part of CO2 emissions not accounted for is the disturbance of forest soil/duff/litter. This is where most of the Carbon in temperate forests is stored, not in the tree boles. Modern industrial logging, particularly in BC, is done with large scale deforestation – excuse me, we’ll be polite and call it “even aged management,” or some other euphemism for giant clear cuts. The soil disturbance results in huge amounts of Carbon being released. And much of that carbon won’t be recaptured by growing organisms for well over 100 years. And you have to wonder about the Carbon emissions from hauling heavy biomass 100 or miles in BC, let alone around the world. I’ve yet to see a single one of these ploys for new markets undergo really rigorous and complete full cycle accounting for their true Carbon emissions.